Meet your knowledgeable guide in the Grand Ole Opry to start your small-group tour of the concert hall that made country music famous. As you walk backstage, hear entertaining stories form your guide about the Opry and the country music greats who have played here since the original radio show debuted in 1925. 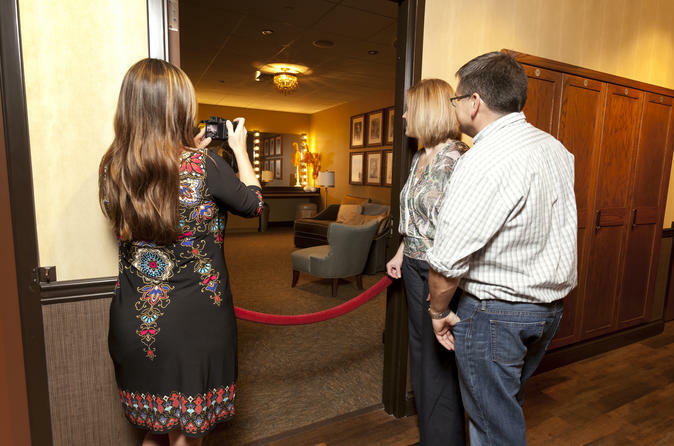 Look at photos from key moments in the history of the Opry and snap your own photos of the artist’s entrance, where superstars and up-and-coming musicians alike make their entrance before a show. Have the chance to walk on stage and step onto the famous wooden circle where hundreds of artists have performed. The six-foot oak wood circle was cut from the stage of the Opry's former home at the Ryman Auditorium. Legends such as Patsy Cline, Uncle Dave Macon and Ernest Tubb once performed on the same boards. Your tour also stops in Studio A, a live television studio that once broadcast the TV show Hee Haw. Then get a glimpse of some of the artist’s dressing rooms, which were refurbished after the Nashville flood of 2010. Each room features a theme such as the 1960s-style "It Takes Two" room, which is dedicated to great duets like June Carter and Johnny Cash. To round out your tour, watch a video hosted by a newer member of the Opry family, Blake Shelton. Throughout your tour, via video, the young country music star gives you his perspective on what it’s like behind the scenes at the Opry. You also get to see performance footage from the past and details about more recent events, including the 2010 flood that caused considerable damage to the building.